We connect government and business to vital technology resources throughout Northern New Mexico and across the U.S. We understand the importance of dependable technology infrastructure that your staff needs to concentrate on their work – not the technology that makes it possible. Cyber security services provide data protection: – Network Perimeter – Firewalls to restrict network access reducing attack surface. – Security Assessments – Vulnerability scans and configuration audits.- SPAM and webfiltering – Reduce exposure to data loss and system compromise by filtering and blocking malicious email and web sites. We deploy LAN and WAN technologies providing stable and secure connectivity for your mobile workforce as well as your satellite offices. Utilizing firewall and VPN technologies your network perimeter will be secure while allowing for convenient access for authorized members of your team. Efficiency and stability are effectively achieved by virtualizing a portion or all of the server environments. 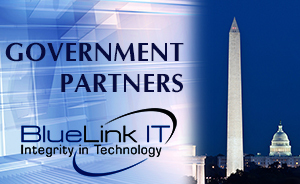 BlueLink IT Solutions deploys virtualization technology from Microsoft (Hyper-V) and VMWare. We deploy solutions from Citrix and Microsoft for secure remote access. We also utilize various VPN solutions, as well. Our advanced system design provides the highest level of uptime, using proven hardware and software solutions, while prioritizing the needs and means of the organization. Proprietary file sharing technology allows end users to open, share, synchronize and secure their files from anywhere, online or offline. Additionally, users can provide access to a single file or an entire folder of files on their secure server with easy-to-use links. Our enterprise SABERSYNC technology provides Disaster Recovery and Continuity, even if hard drives crash or computers are stolen. Every time a file is changed or a new file is saved, the data is automatically backed up to secure servers in the Cloud. BlueLink IT managed services provide 24/7 monitoring and management of critical IT systems; improve performance and reliability; assure proactive maintenance of computer systems; and support for all hardware and software needs. You can have access to the same resources that large organizations have without the cost of in-house staff. BlueLink IT managed services provide 24/7 monitoring and management of your critical IT systems; improved performance and reliability; proactive maintenance of your computer systems; and support for all your hardware and software needs. Providing secure and effective access to applications to remote workforce, assuring business continuity and stability. Citrix, Microsoft and VPN technology, as well as SaberSync are included in our design systems. We deploy LAN and WAN technologies providing stable and secure connectivity for your mobile workforce as well as your satellite offices. Utilizing firewall and VPN technologies your network perimeter will be secure while allowing for convenient access for authorized members of your team. Reduce overhead and increase capability at the same time by deploying a portion, or all, of your server infrastructure in the Cloud. BlueLink has successfully addressed organizations’ general availability, disaster recovery, and business continuity needs using Amazon Web Services. Greater computing efficiency and stability is achieved by virtualizing a portion or all of the server environments. BlueLink IT Solutions deploys virtualization technology from Microsoft (Hyper-V) and VM Ware. Our enterprise file sharing technology allows business users to open, share, synchronize and secure their files from anywhere, online or offline. With our enterprise SABERSYNC technology Disaster Recovery & Business Continuity are assured even if hard drives crash or computers are stolen. Every time a file is changed or a new file is saved on your computer, the data is automatically backed up to secure servers in the Cloud.